Traditionally flipped learning involves students interacting with new knowledge in their individual learning space so that the group learning space can be an interactive and dynamic environment to practice and deepen knowledge1. In a world where the value of knowledge is rapidly depreciating, there are calls to move away from knowledge-based curriculum and to consider not the “how” of education but the “what” of education. Taking this a step further, the central question has to be, the “why” of education. Why do children need an education? What is the purpose of education? In a rapidly changing world, the curriculum has been slow to change. The current curriculum reflects the world as it was in the late 1800s not the world today and certainly not the world of the future. The purpose of school has to be to prepare students for the world of today and the world of the future. The 21st century is a period of rapid change. There is rapid and continued growth in technology and its use, globalisation of markets and international mobility, increased automation and offshoring, over population, over consumption, changing climate and depleting natural resources and ongoing global violence2. As a result of these local and global pressures, there is a loss of many jobs and a rapid emergence of new careers. However, there is an ever-increasing gap between what students are learning at school and what employers’ need4. Andreas Schleicher the Director of Education and Skills, OECD, says that “today, schools need to prepare students for more rapid economic and social change than ever before, for jobs that have not yet been created, to use technologies that have not yet been invented, and to solve social problems that we don’t yet know will arise”5. In 2008, IBM surveyed 1500 company leaders in 80 countries and 33 industries, to determine what characteristics they need in their staff. They identified two priorities; adaptability to change and creativity in generating new ideas. They also found these two characteristics lacking in graduates4. The changing employment landscape is seeing many jobs disappear, being replaced by automation or offshoring. However, even more jobs are being created. Importantly however, these new jobs require significantly different skill sets from the old jobs. Workers that are capable of adapting and learning will be able to continually reposition themselves and remain relevant and employable2. Traditionally, the curriculum has focused on knowledge. However, in the information age, the value of traditional knowledge is becoming less and less valuable. In a world where Google knows everything, people are no longer rewarded just for what they know. What is valued is what people can do with what they know. Being able to synthesise information, critically think about information and make good choices based on the information6. As a case in point, every year, before I teach a unit, I have to reteach myself the content because I have forgotten the finer points. However, I can quickly and efficiently get back up to speed by accessing the content again- just in time. The Center for Curriculum Redesign believes that school is not consistently and effectively teaching students the competencies they require to succeed in the world of tomorrow2. They have proposed a move away from the traditional knowledge-focused curriculum to a four dimensions framework of educational goals. The intent of the framework is to “balance content knowledge and understanding with skills that apply that knowledge to the real world; character qualities that build motivation, resilience and social/ emotional intelligence; and meta-learning strategies that help students become reflective, self-directed and expert learners”7. 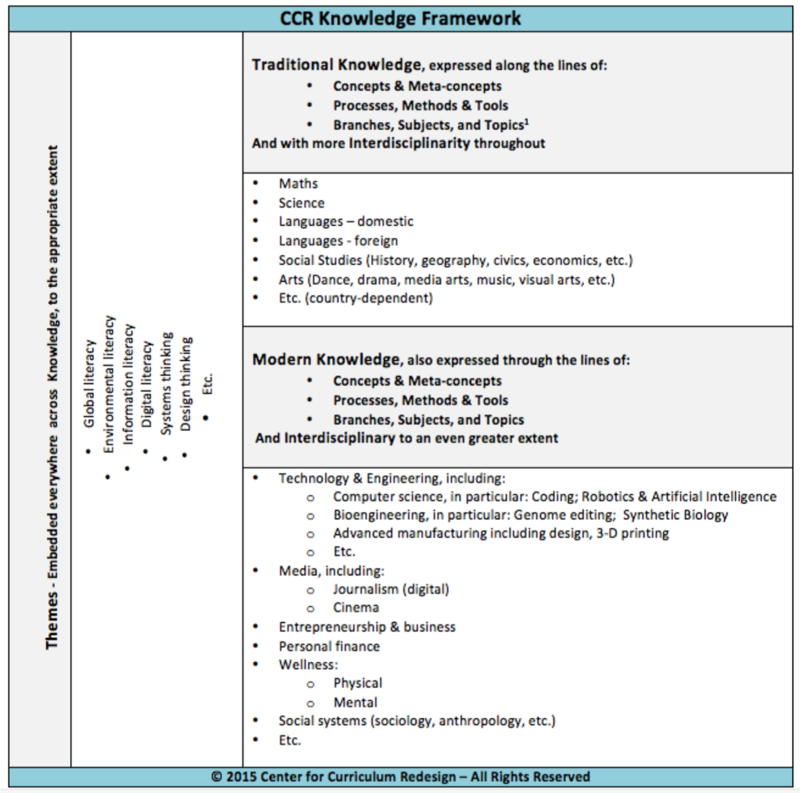 The knowledge dimension is “what we know and understand.” Because of the crowding of the curriculum and the depreciating relevance of some traditional content and subjects, traditional subjects need to be curated for relevance and meta-concepts identified. With the ready access to information on the internet, the need to cover all of the content in a particular subject is no longer necessary. Instead, the CCR recommends focusing on understanding the key aspects, or the meta-concepts and big picture processes of the discipline, in a meaningful way. The key aspects are those with intrinsic value. This means the 21st-century concepts and competencies that are over-arching and are relevant across disciplines. It is the knowledge that we want to stick with students after school where it can be built on with further study or applied in life and the workforce regardless of the field. An example of a meta-concept could be feedback loops that have application in robotics, programming and homeostasis. An example of processes that have application across disciplines could be generating and testing hypotheses. Students, and teachers are regularly drowning in the enormity of the content that needs to be covered in the curriculum, so fail to see the big picture of the key aspects. A curriculum that is stripped down to these meta-concepts and big picture processes is likely to improve comprehension and retention of knowledge and student engagement. Curating the “what” of education, that is, the key learning goals based on the “why” of education will free up space in the curriculum for the introduction of modern disciplines such as technology and engineering (including robotics and coding), media, entrepreneurship, personal finance, and wellness. Again these are focused on understanding the key concepts in a meaningful way with meta-concepts, processes, and methods. Flipped learning continues to be very relevant in the knowledge dimension but perhaps with some minor tweaking for some flipped educators, myself included. Instead of generating a raft of videos for all the detailed content, Flipped educators should focus their videos on the key meta-concepts and processes and make the connections with other disciplines more explicit. A major advantage of flipped learning is that students interact with new content in their individual learning space so that more class time can be spent practicing and deepening the knowledge. Effective flipped learning includes meaningful and authentic learning experiences to practice procedural knowledge and deepen declarative knowledge. The themes provided in Four-Dimensional Education represent important strands that are relevant across many traditional and modern disciplines. These themes include the following; global, environmental, information, and digital literacies and systems, and design thinking and are to be embedded across disciplines as appropriate2. Again, the class time saved by flipped learning affords the flip educator with precious class time to embed these important cross-curricular themes. For example, when teaching ecology, a meta-concept would be the interrelatedness and interdependence of different species in an ecosystem. An obvious relevant theme would be environmental literacy. Equally, it is a perfect concept to include systems thinking. As flip educators, we need to take advantage of the extra class time to embed the 21st-century themes where ever we can. Four Dimensional Education2 provides in-depth detail and justification of each of the themes as well as the proposed modern disciplines. I highly recommend you read this insightful and thorough work to appreciate why they have included each theme fully and to consider how you can include the themes in your classroom. The skills dimension is “what we do with what we know”2. 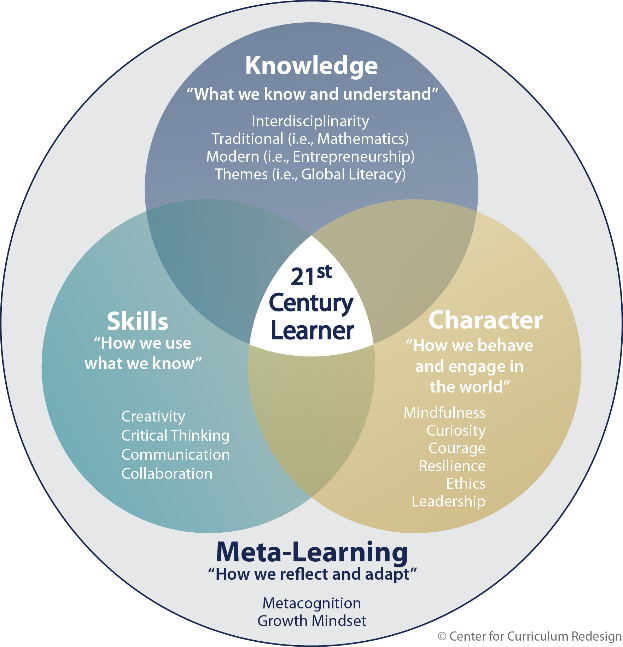 The CCR has focused on four 21st Century skills that are required to prepare students for the complexity of life and work in the 21st Century. These “eduployment” skills are communication, collaboration, critical thinking, and creativity and are in high demand by employers2. If the “why” of school is to prepare students for the future, the “what” must include developing these skills. Knowledge and skills need to develop together. We always learn by learning something5. The knowledge “becomes the source of creativity, the subject of critical thought and communication, and the impetus for collaboration”10. So the meta-concepts and processes are the context around which the 21st-century skills are applied. Students typically retain knowledge better and are better able to apply their knowledge in novel, real-world contexts when learning is active. Project-based learning, problem-based learning, inquiry-based learning and constructivism are all active learning pedagogies that authentically construct knowledge and skills by focusing on solving problems. Instead of front-loading the content, the new concepts and processes are the support to solve the problems and are the context for developing 21st century skills. These activities promote active involvement, self-regulation, communication, collaboration, and self-reflection10. Student created video content is an emerging form of flipped learning that nicely supports the deepening of knowledge as well as developing 21st century skills of creativity, critical thinking and communication. Character education is “how we behave and engage in the world.” It is about developing values and beliefs and using them to guide decisions and choices. The CCR has identified six character qualities; mindfulness, curiosity, courage, resilience, ethics and leadership. Flipped mastery fits in perfectly with developing some of these character traits. Flipped mastery is a student-centered pedagogy where students set individual goals and manage their learning. Students alternate between interacting with new knowledge via video and practicing and deepening their knowledge to work towards the mastery of a topic before they move on to the next topic. Sal Khan has observed that through flipped mastery students demonstrate deeper learning of concepts, and students build important character traits such as grit and perseverance and they take agency over their learning9. The meta-learning dimension is about thinking about thinking 2. Meta-learning involves students setting goals, reflecting on their learning with respect to the goals and then adapting their learning behaviours. This process of self-reflection helps students internalise a growth mindset. Again, flipped mastery can be an effective tool here if done well9. Meta-learning improves the application of knowledge, skills, and character qualities beyond the context in which they were learnt2, so can be applied in novel, real-world situations. In the flipped classroom, the teacher can spend time with every student, in every class, every day1. Conversations with students allow the teacher to identify closed mind set language like ”I don’t have a math brain” or “I can’t do this”. This presents an opportunity to challenge the student to reflect reframe their mindset. Flipped mastery, that focuses on the meta-concepts and processes and involves active, student-centred learning experiences, can be an effective tool for developing 21st century competencies across the four dimensions. The active learning strategies listed above, including PBL and inquiry are excellent tools for developing the character and meta-learning dimensions. Active learning experiences give students the tools to be “versatile, reflective, self-directed and self-reliant”2. Essential skills for a changing world. It is not the videos that the teacher produces or finds that build character and self-reflection, but the videos provide the class time necessary to devote to activities that build character and self-reflection. There are potentially many opportunities to incorporate flipped learning into the Four Dimensional Education framework, to enhance the learning of 21st century knowledge, skills, character and mindset. Flipped learning done well, can enhance deep learning and develop students who are versatile, reflective, self-directed and self-reliant2. Flipped learning is not the only strategy, and it is not always the best strategy. However, I believe that flipped learning can make a significant contribution to the educational goals of the Four Dimensional Education framework. Providing flipped learners are guided by the “why” of education, flipped learning can be an important “how” tool to address the “what” of education outlined in the Four Dimensional Education framework. A quote from Einstein states that “We cannot solve our problems with the same thinking we used when we created them”2. Ken Robinson4 has observed that it was human creativity that has caused many of the issues we now face as a planet. However, human creativity is also what is needed to solve the Earth’s problems. The Four Dimensional Education Framework provides a comprehensive tool to navigate the priorities for 21st century education. While I wait for educational reforms to be rolled out, I feel empowered as a teacher-designer to design change from the ground up. Bergmann J and Sams A (2014). Flipped Learning. Gateway to student engagement. International Society for Technology in Education. Eugene Oregon. Fadel C, Bialik M and Trilling B (2015). Four Dimensional-Education. The Competencies Learners Need to Succeed. The Centre for Curriculum Redesign. Boston MA. Sinek S (2009). Start with why: how great leaders inspire everyone to take action. New York NY. Robinson K (2015). Creative Schools: Revolutionizing Education from the Ground Up. Schleicher A (2015) Forward. Fadel C, Bialik M and Trilling B (2015). Four Dimensional-Education. The Competencies Learners Need to Succeed. The Centre for Curriculum Redesign. Boston MA. Wilson E (1999) Consilience: The Unity of Knowledge. Vintage. New York NY. Fadel C, Bialik M and Trilling B (2015). Four Dimensional-Education. The Competencies Learners Need to Succeed. The Centre for Curriculum Redesign. Boston MA. Page 31. Marzano R and Toth M (2014) Teaching for Rigor: A Call for a Critical Instructional Shift http://www.marzanocenter.com/files/Teaching-for-Rigor-20140318.pdf Accessed 7 November 2015. Khan S (2015, November) Sal Khan: Let’s teach for mastery- not test scores. Retrieved from http://www.ted.com/talks/sal_khan_let_s_teach_for_mastery_not_test_scores. Accessed 2 October 2016. Fadel C, Bialik M and Trilling B (2015). Four Dimensional-Education. The Competencies Learners Need to Succeed. The Centre for Curriculum Redesign. Boston MA. Page 89. Thanks to Charles Fadel and Jon Bergmann for advice and support. You can purchase a copy of Four Dimensional Education from www.curriculumredesign.org. Buy it, read it, implement it and talk about it!